The United States is the richest country in the world, yet students have to take on crippling debt in order to get a college education. We need change, and change starts in the streets when the people demand it. With students, college graduates, and workers united we can build a movement capable of winning debt-free college for all and a $15 minimum wage for all campus workers! 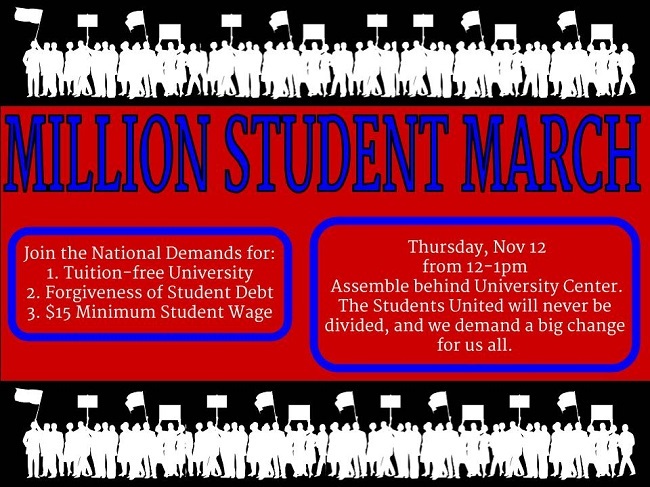 On Thursday, November 12th at 12pm, students, professors, and community members at UMD will be joining the national movement to demand free public higher education, an alleviation of all student debt, and a $15 minimum wage for all university employees! The action is a march on UM-Dearborn’s campus, 4901 Evergreen Rd Dearborn, MI and we’ll be meeting at the University Center building!